Charles Dixon RI (1872-1934). Watercolour with added bodycolour; signed (LL). Writing now discovered on the back of the watercolour suggests that this is HMS LION (Captain A E M Chatfield CVO RN) flying the flag of Vice Admiral Commanding 1st Battle Cruiser Squadron (A/Vice Admiral Sir David Beatty KCB MVO DSO) who, together with fellow battle cruisers QUEEN MARY and PRINCESS ROYAL, is racing in to support British light naval forces under presure in Heligoland Bight in the early afternoon of 28th August 1914. Belching smoke and with their bows well up and their sterns tucked down, the ships are clearly cramming on speed: they were capable of the then phenomenal speed of around 27 knots (LION had boasted nearly 31 knots briefly on the Arran measured mile whilst on builder’s trials in 1912). At this sort of a lick LION would devour some 50 tons of coal an hour and the stokers down below would have been working flat out in intense heat to keep the furnaces supplied. Paintwork on funnels would have been scorching and blistering and up on the bridges of the ships there would have been a cacophony of deafening noise as wind screeched over the bridge screens and screamed through the long signal halyards: indeed Dixon has shown here the figures at the front of the bridge hunched forward as they lean into the wind to maintain balance! Added to this must have been the huge roar coming from the impossibly tall fighting tops above as they vibrated, rattled and tore forwards through the slipstream. Hissing bow waves and the crash of heavy spray as it whacked inboard and against the forrard turrets and screens would have made even the briefest of shouted commands on the compass platform almost impossible to hear. Once the main armament went into action - as here - the ting ting of the “guns ready” gongs followed moments later by the crashing percussion and air pressure of the guns firing must have magnified these problems a hundredfold. 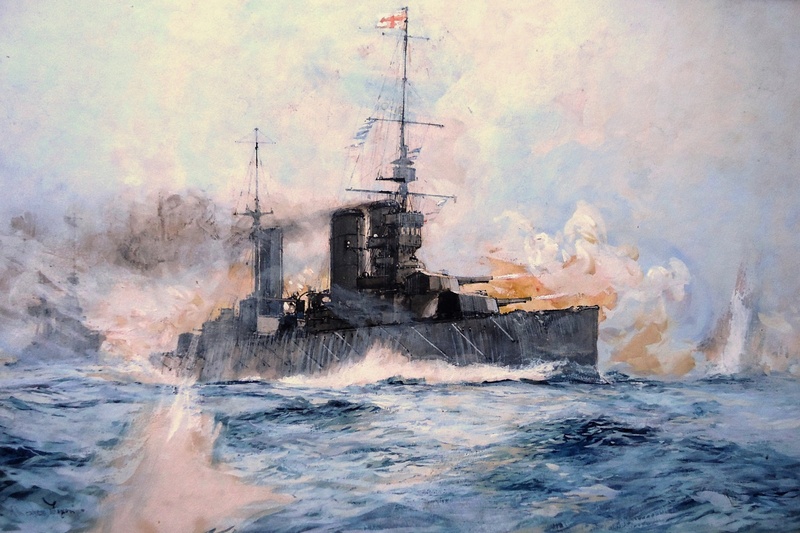 For all their vulnerabilities which were to be exposed so starkly some two years later at Jutland when QUEEN MARY from this squadron blew up with considerable loss of life and LION and PRINCESS ROYAL took heavy punishment also, these were a very special type of ship. Heavier, longer, narrower and faster by far than their contemporary dreadnought battleships, they were, we are told, a sight never to be forgotten and from the world’s first battle cruiser, INDOMITABLE, through others including TIGER, GLORIOUS, COURAGEOUS, FURIOUS, RENOWN, REPULSE and then finally HOOD, they were unequalled for sheer beauty, grace and style. Indeed, only a few moths before this action Beatty had taken LION, QUEEN MARY, PRINCESS ROYAL and NEW ZEALAND on a characteristically high profile visit to St Petersburg where a combination of the dashing admiral’s youthful, cocky panache and his squadron’s breathtaking grandeur and impressive firepower had deeply impressed the Tsar and the Imperial Russian Court.